No one promised them a fair fight! The saga first started by John Cena and then carried on by WWE superstar The Miz is back with an all-new action-packed chapter. The Marine 6: Close Quarters is coming this fall, and it pairs The Miz with WWE cohort Shawn Michaels and Becky Lynch. Don't pretend like you don't know what's up. Today, we have an exciting first look at The Marine 6, which hits like the hardest fist in this franchise yet. There are so many explosions and so much fighting, you won't know what to do with yourself. Mike 'The Miz' Mizanin returns as Jack Carter in the action-packed adventure, which will be hitting digital, Blu-ray™and DVD on Tuesday, November 13 from Sony Pictures Home Entertainment. 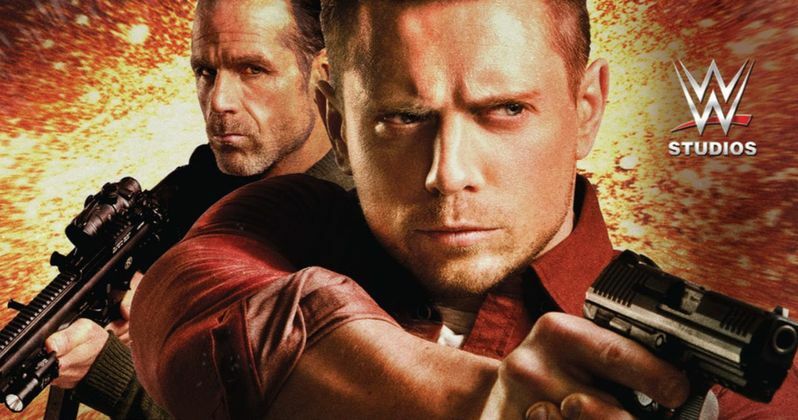 Jake Carter and another former Marine, Luke Trapper (Shawn Michaels), join forces to rescue a kidnapped girl from a gang of international criminals. The sixth installment in the successful franchise also stars Louisa Connolly-Burnham (Time Will Tell), Terence Maynard (Edge of Tomorrow) and Tim Woodward (K-19: The Widowmaker). The digital, Blu-ray and DVD releases of The Marine 6 include two exciting featurettes that take fans behind-the-scenes! In "Making Maddy & The Marines," The Miz and Shawn Michaels bring the shock and awe as they take on the no-nonsense newcomer, Becky Lynch. Fans will share in the action as they highlight their experiences on set and what it was like to work together. Then, fans will watch the action come to life as the WWE Superstars and stunt choreographer Tim Man break down the fight scenes and reveal how they trained for their roles in "The Breakdown: Epic Fights." In the movie, Jack Carter (WWE Superstar Mike "The Miz" Mizanin) and another former Marine, Luke Trapper (WWE Superstar Shawn Michaels), join forces to rescue a kidnapped girl (Louisa Connolly-Burnham) from a gang of international criminals headed up by Maddy Hayes (WWE Superstar Becky Lynch). Directed by James Nunn and written by Craig Walendziak, Close Quarters is produced by Michael J. Luisi and executive produced by Richard Lowell. The Marine 6 has a run time of approximately 85 minutes and is rated R for violence throughout, and some language. We have a look at the explosive cover art, which features The Miz and Shawn Michaels. You can check out the exciting trailer which arrives from Sony Pictures Home Entertainment.